The Telescope, a one act play about the discovery of hope is written by Kevin Wilson. You can licence this play at Ready Made Theatre. This production was premiered at the Ventnor Fringe Studio Theatre, 16 - 18 August 2012. We got an immense amount of positive feedback about this double bill. 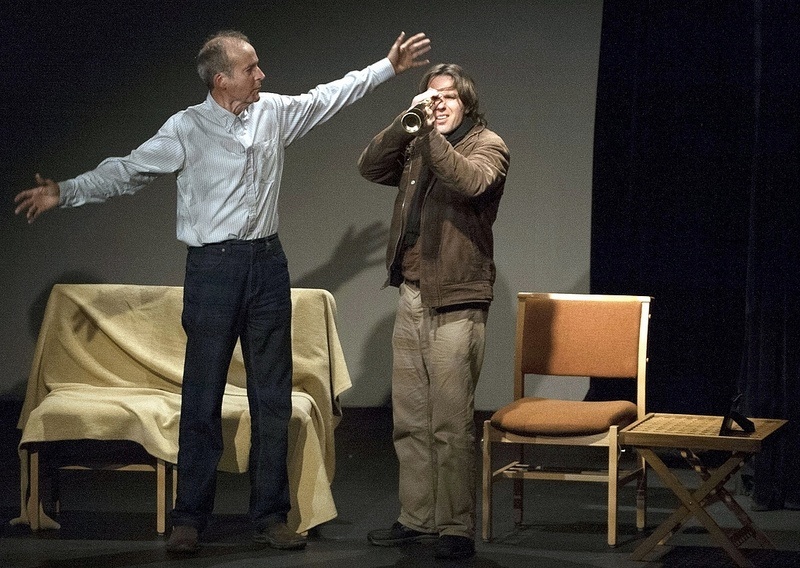 Audiences described it as 'thought provoking', 'emotional', and 'a perfect balance'. The premiere of The Telescope, starred Patrick Barry, Rebecca Brough and Kevin Wilson. Review from the Isle of Wight County Press. Staged as a double bill, we also performed A Lady of Letters, by Alan Bennett, starring Jane Moore. Review from the Isle of Wight County Press. The Telescope, was also performed at Chale Church on Friday March 22 2013. The wild and grey weather made for a very authentic setting, and we are grateful to everyone who braved the conditions to come and see us! Origins Theatre's first foray into mainland theatre resulted in a nomination for best play, and a trophy for best supporting actor. The group was the only outside theatre company to enter the Harold Jolliffe One Act Play Festival, at the Swindon Arts Centre. Patrick Barry, Emily Scotcher and Kevin Wilson staged The Telescope, written by Kevin, in front of a full house and a member of the Guild of Drama Adjudicators. Origins Theatre did not win the ultimate prize of best play, but Kevin said: "It was a bit of an adventure, and we were so pleased to be nominated. The adjudicator told us it was a very close run thing, so it gave us a lot of confidence for the future, and his feedback will also help us learn and develop. "Our performance got high marks for the acting, so I was really proud to win a trophy for best supporting actor. The last time I won a cup it was in a school swimming competition, so it will take pride of place on the windowsill now!"